MANHATTAN — The Financial District will unseat the Flatiron to become the city's startup hotbed in 2014 — and don't be surprised if more commercial real estate projects include rooftop decks and show up in Brooklyn's hip neighborhoods, experts predict. New York City's commercial office market is all about where the new jobs are, making the tech world and creative industries the anticipated trendsetters for the coming year, according to commercial real estate experts. Computer programming services and management- and technical-consulting firms have seen the largest recent growth in the city. There were roughly 244 custom computer programming firms added to the real estate landscape between June 2012 and 2013, representing a 5.6-percent increase. The number of management- and technical-consulting firms and advertising and public-relations shops swelled by nearly 7 percent, according to Heidi Learner, chief economist at Studley, citing Bureau of Labor statistics (UPDATE: the company has since changed its name to Savills Studley, 9/2014). The Cornell NYC Tech graduate school, which started classes in September in a temporary space at Google's Chelsea office, is slated to break ground in early 2014 on its $2 billion campus on Roosevelt Island. Along the East Side of Manhattan, up through Harlem, there’s been a focus on creating office space and incubators for biotech firms big and small. 4 WTC cut its ribbon at the end of 2013 and 1 WTC is scheduled to open in early 2014, Learner said. As these buildings open — along with the Fulton Transit Center, which is expected to be finished by June 2014 — more companies will have their eyes on opening in or relocating to the area, many predict. With Condé Nast’s media empire set to be the anchor tenant at 1 WTC — leasing 1 million square feet in the glittering glass building formerly known as the Freedom Tower — and the hot advertising agency Droga5 moving from Midtown to a 90,000-square-foot space on Wall Street, the area is poised for a makeover. Besides big firms like these, many startups that moved to the Flatiron — which had been the buzz-worthy neighborhood for the office market in 2013 — are now looking to Downtown, Learner said. The average price per square foot for office space in Lower Manhattan was $52.49 in the fourth quarter of 2013, compared to $66.24 for Midtown South, according to Studley's preliminary figures. Lower Manhattan also has nearly 20 hotel projects under construction or planned, with more than 1,700 new rooms slated to open in 2014. A slew of new retailers, including a Fairway market, are expected to open in the Spring two blocks from the World Trade Center, according to a report by Cushman & Wakefield. DUMBO, which is already a hotbed for Brooklyn's tech and creative companies, is going to have company. Office projects are planned in Gowanus, Bushwick and Crown Heights, noted Dave Maundrell, president of aptsandlofts.com, which was tapped to be the broker for a 400,000-square-foot building for “creative types” set to rise near the Williamsburg waterfront, stretching from Kent to Wythe avenues between North 12th and 13th streets. “There’s more office space planned for Brooklyn than you could imagine,” he said. "And when you put in office space, then you need cafés and coffee shops and other new services." Office rents in Williamsburg are going for roughly $50 a square foot, he said. Many of the city’s new wave of startups prefer space with concrete floors, exposed ceilings and open floor plans — not the best design when it comes to noise levels. So, companies are now looking for ways to include sound-absorbing materials to create a more balanced work environment, said Scott Spector, principal of the Spector Group, an architecture and interior design firm. “Everything was bouncing off the walls,” Spector said. His go-to troubleshooting moves include adding furniture with more cushions or installing fabric panels on walls, since firms still want to keep the look raw. "They don’t want corporate,” Spector said. 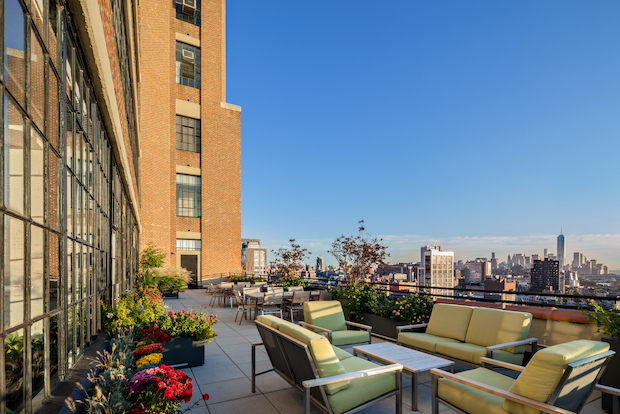 From large companies to boutique firms, many offices now want roof terraces, much like residential buildings, said Spector, whose firm recently designed a terrace for a spirits company on Park Avenue near East 47th Street, and for a financial services firm that recently moved into the Starrett-Lehigh Building on West 26th Street near the Hudson River. “It’s a place to get away,” Spector said of the terraces, that also provide a pleasant green space to look at when working inside. As more New Yorkers bike to work, companies are requesting larger bike storage spaces, and some landlords are creating common areas for bike storage to save their tenants added real estate costs, Spector said. "It’s a green initiative, but it’s also about retaining certain employees,” said Spector, who has been designing bike spaces for firms in Brooklyn, Downtown Manhattan and Midtown South. In 2013, coffee shops, hotel lobbies and urban plazas increasingly became places where freelancers schmoozed and conducted business. In 2014, workplaces are picking up on the trend by creating “in-between places” and more lounges where people can meet and brainstorm in smaller groups, said Billy Hallisky, senior designer at Luckett & Farley’s Media + Entertainment Group, which specializes in creative-media workplaces. “It’s these common spaces, these interstitial spaces — everybody is on the move, give people a chance to peel off into the hallway — that’s where the work is being done,” he said. For offices that have the real estate, more of them will transform space into galleries that can be used for workers as well as for community events, Hallisky predicted. One space he worked on at an office in Riverdale, for instance, recently had a show of photos by children, taken on their parents' iPhones. Cold-pressed juice bars are leading the charge of food retailers snatching up space in Manhattan, said Joseph Robinson of Bond New York. "Cold-pressed juice is looking hot right now, and I think it's going to continue because a lot of people are looking for healthier options and it [is food that] can be done quick," he said. "The days of all the burgers and pizzas are getting pushed aside."